According to a Pitney Bowes survey recently released, QR code use is at an all-time high among US and European consumers. According to the survey of 5,000 consumers, QR code usage on average for all age groups stands around 15 percent, for 18-34 year olds however the rate of use stands at 27 percent and rising. For the 18-34 year olds, who have mostly grown up in a world where they expect information to be literally at their fingertips and easily accessible, QR codes are a perfect way to ensure this expected entitlement continues even with regards to marketing and advertising. Instead of having separate marketing and advertising outlets in traditional media and digital media, QR codes have brought the two together and greatly improved the possibilities and efficiency of both, while engaging the customer in a way they approve and expect. The younger customer certainly benefits by the use of this technology by providing them with the information they desire at their fingertips, but it also has the potential to greatly improve the marketing and advertising efficiency and success of traditional campaigns, and in turn improving profitability. QR codes, assuming the company you are using provides analytics, allow you to track all scans and collect lots of data that can be used to determine the success of the campaign, and how it might be improved. You can find out who is scanning the code and when, which ads are working better than others and why, and generally determine what changes should be made in the future to engage consumers. QR codes use has increased almost four times in the past couple of years and will likely only continue to rise as both marketing firms and consumers become more aware of the benefits and uses of QR codes. This Pitney Bowes survey only indicates that if you haven’t got on board as a marketer or advertiser you need to do so now. Just make sure you choose a company that is going to make sure your campaign is done right. One of the great things about QR codes is that they can add a new dimension to printed materials by sending users directly to video that complements the printed piece. 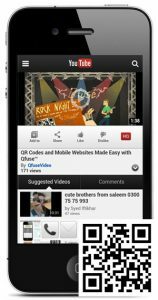 For those who want to point their QR code at a video, YouTube has become a popular option, and with good reason – YouTube offers a mobile-friendly video display, and it’s very easy to simply point your QR code to a URL for a YouTube video. If you just want to share a video, sending users to a YouTube page is a practical option. Unfortunately, this approach also leaves a number of important things to be desired. For one thing, a YouTube page does not provide a branded experience – your visitors will see YouTube’s brand first and foremost, not yours. More importantly, once a user is done watching a video on YouTube there isn’t much they can do to actually interact with your business or organization after they are done watching the video. Send an email, SMS message, etc. The problem is that you can’t do these things with on a YouTube page. If you’re really serious about using QR codes and mobile media as effectively as possible, pointing a QR code at a YouTube page is a missed opportunity to really engage your target audiences and convert their visits into meaningful action. In order more effectively share video through a QR code and also engage viewers, you need to create a custom landing page. With this approach, is approach you embed the video into the page and also offer whatever additional information or call-to-action will be most helpful to engage viewers once they are done watching the video. The next time you’re considering how to promote your business or organization with QR codes and video, make sure you think beyond the video and consider the actions you want viewers to take once you’ve engaged them, and what else you can offer them while you have their attention. 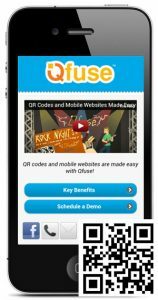 This approach is sure to amplify the results of your next video QR code campaign. Using YouTube as a landing page is great exposure for YouTube, but doesn’t provide much in terms of actionable conversions or brand awareness for your business or organization. A custom landing page not only provides the visitor with a video, but also a number of other options for engagement and direct interaction with your brand. Creative uses of QR codes are everywhere these days as companies try to find new ways to enhance their brand or engage customers on a new level. One of the coolest examples I have found was from the video game ‘Homefront’. 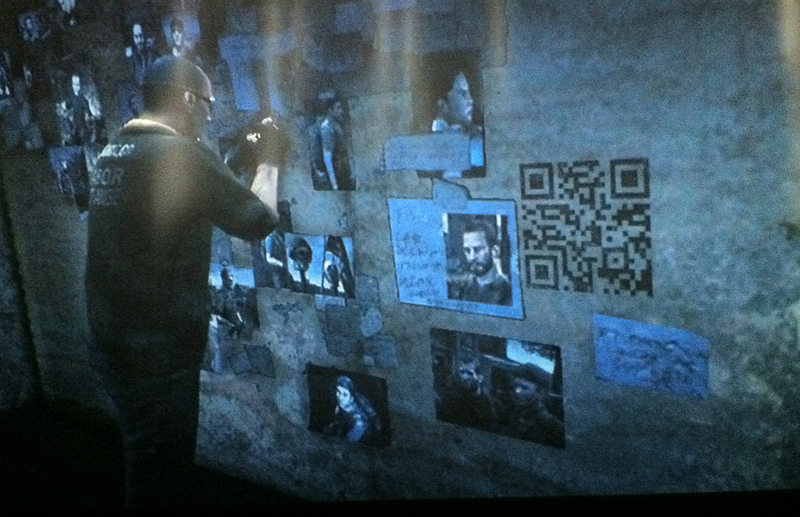 What the Homefront makers did was hide QR codes throughout the game, and purposefully did not advertise this fact. Instead they let players stumble upon them, and due to the curious nature of people players scanned them to see what it was. What the player found was additional game information, which helped develop the game story even more and engage the player in a way never seen before. For example a player may have scanned the hidden QR code they found and it would have directed them to a propaganda video by one of the factions in the game. This extends the video game outside of the platform, ads a bit of extra fun to the game, and makes it all more interesting. In fact just two days after the release of Homefront, they had over 30,000 QR code scans despite the lack of advertising for the codes. Some of these QR codes also provided free downloadable content for the player, creating additional value to the experience and ensuring players came back for more. This use of QR codes by the makers of Homefront helped improve the game experience of the players, increased the brand, and engaged players on a level not seen before. These sort of uses for QR codes are just the beginning. Similar uses could do more than just add interesting content or provide free material, they could also find ways to offer deals or products within the game, and find ways to drive sales and increase profitability, all while improving the experiences of the gamer. QR codes are a fantastic way to drive interest, engage consumers and improve a product or service, Homefront is just one of many such uses that have done this with great success. You should expect to see even more creative uses in the future. It seems like every day there is a new creative way individuals and companies are using QR codes to improve customer experience, get a message out, increase sales, or simply to entertain people. The latest use I stumbled upon was J.C. Penny using QR codes to create added value for their holiday customers. It seems like the companies, or individuals, who use QR codes the best are those that are able to think out of the box and J.C. Penny sure did that here. When a customer came into the store and purchased a gift they could also pick up a “Santa Tag”. 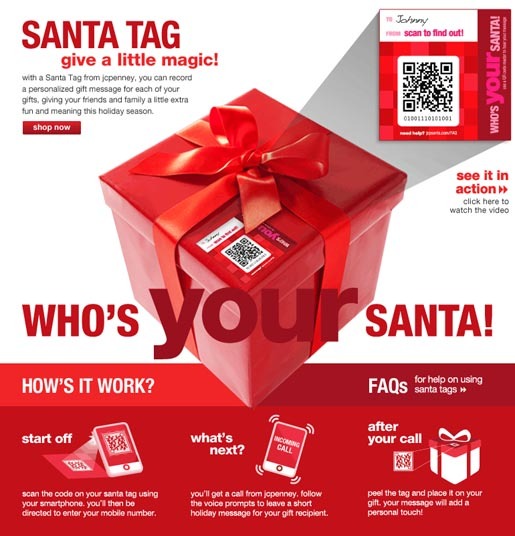 What this tag allowed them to do is attach a personalized voice message with their gift, so when the gift is opened on Christmas morning the recipient also received an audio season’s greetings as well. How this worked was each “tag” was equipped with a QR code. The customer would scan the QR code and be prompted to give their voice greetings. Their greetings would then be recorded, the “tag” then taped to the gift (each “tag” has adhesive on one side) and on Christmas morning when the recipient receives the gift he/she would be prompted to scan the QR code and the recorded message would be played. How cool is that?! This sort of QR code use may not increase efficiency, or drive sales, but it certainly creates a value added for the customer and may even help improve customer loyalty. These sorts of creative experiences for the customer and recipient will certainly be remembered and increase the goodwill of those involved. J.C. Penny is just one more example of how creative uses for QR Codes abound and can improve a customer’s experience. It is a wonder why so few companies have yet to jump on the QR code bandwagon. Most museums, whether they are art, history or any other subject, often times have little more than a paragraph on a plaque explaining the exhibit. If you are not already well versed in the subject at hand you will likely be at a loss for what you are viewing, and hard pressed to learn very much about the subject with the little information being provided to you. The answer to this problem for museums isn’t to post essays on the plaques, besides being an unpleasant look it would also be clumsy, lack engagement and during busy times wouldn’t be very efficient for the museum goers. Instead what museums must do, if their goal is to increase traffic, teach museum goers, or simply improve the museum experience, is to find ways to engage the visitor by providing interesting and relevant information in an exciting, convenient media. Enter the QR code. The way to accomplish these goals–that is how to drive traffic, help uneducated visitors learn and improve the overall experience–is by allowing museum goers to access information by QR code. This may seem like a simple task at first, and perhaps for those skeptics out there you may even question that it would even work, but there is far more to this then simply posting a QR codes next to an exhibit and having it direct you to a Wikipedia page on the subject at hand. No, for this QR code technology to work the visitor must be directed to media that is engaging, interesting and requires little effort. So what does this mean? Instead of simply having the QR code direct a person to an article or written source on the subject, the QR code should direct someone to an interactive website, a video on the subject, or an audio tour of the exhibit or particular item. The latter allows for private, free, audio tours for anyone with a smart phone and earphones and can provide far more information than just a small plaque. As visitors enter an exhibit a sign would alert them to the free audio tour on their own personal smart phone upon scanning of the code (instructions on how to do this must be given also). The tour would then guide them throughout the exhibit. Or another great way to engage the visitor, if the visitor wishes not to take a full audio tour, is to have codes provide audio specific to a particular item, or video specific to an exhibit or sub-exhibit. The video would need to be relevant, exciting and maybe five minutes long at most. This would ensure the museum goers were engaged, interested, and learned more than they otherwise would have with just a plaque. As long as the QR code directs the visitor to an interactive and relevant landing page, this should ensure the success of the undertaking. Many museums around the world have begun to use the QR code technology to improve the customer’s experience, with some doing a much better job than others. A couple great examples are Cleveland Museum of Art , the Bologna Museum of Archeology (along with many other Italian museums) and the Smithsonian Natural History Museum. Both the Cleveland Museum of Art and the Bologna Museum of Archeology have begun using QR codes that upon scanning allow the visitor to be taken on an audio and video guided tour of particular galleries and exhibits or entire museum tours, greatly enhancing the visitor’s experience. The Smithsonian natural History Museum have used QR codes in various ways, but one creative, fun, and interactive way was using it as part of their Neanderthals exhibit. Upon scanning the QR code the visitor was sent to a landing page where they could upload a photo of themselves and the site would show them what they would have supposedly looked like some 30,000 years ago. This could then be shared on the various social networks. Of course this isn’t terribly educational, but it is fun and engaging and a way to drive interest and excitement for the museum. 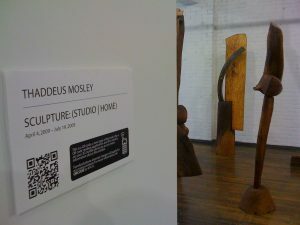 There are all sorts or creative ways museums could use QR codes to drive traffic and improve overall experience for the visitor. But just using QR codes is not enough, a QR code is only as good as the media it is linked to, so one must make sure that the scanning of a QR code is worth the effort or the QR code campaign you are attempting will more than likely end in failure.